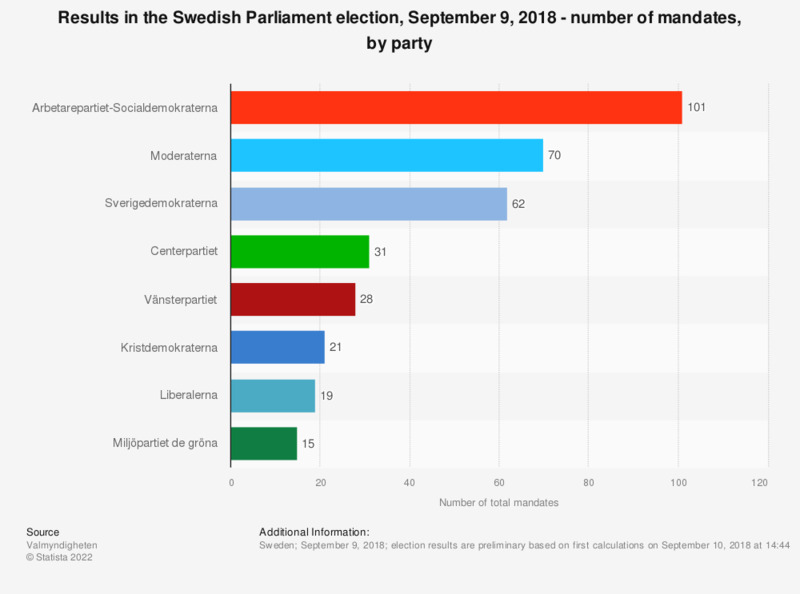 This statistic shows the number of mandates each political party received during the parliament elections on September 9, 2018 in Sweden. Based on first calculations on September 10, 2018, Arbetarepartiet-Socialdemokraterna was the biggest party in the parliament with 101 mandates. In second place came Moderaterna with 70 mandates. Sverigedemokraterna ranked third with an election result of 62 mandates. Swedish Parliament (Riksdag) elections are held every four years. The next parliamentary election is set for 2022. Swedish Parliament (Riksdag) elections are held every four years in Sweden. A proportional election system is being used, the amount of mandates is distributed accordingly to the share of votes received by a party. The prospective members are selected by their party. In order to win seats in the Riksdag, a party must win at least four percent of the vote nationally. The unicameral Parliament of Sweden has 349 members. Statistics on "Israel: Knesset election 2019 "
2014 midterm election: interest in the election and motivation to vote in the U.S. If you were a member of the Senate, would you vote for or against the constitutional reform?